Set of (2) registration numbers - Approximately 2.25" tall by 15" long OR 20" long by 3.5" tall. Custom sizing available on request - check your state regulations! 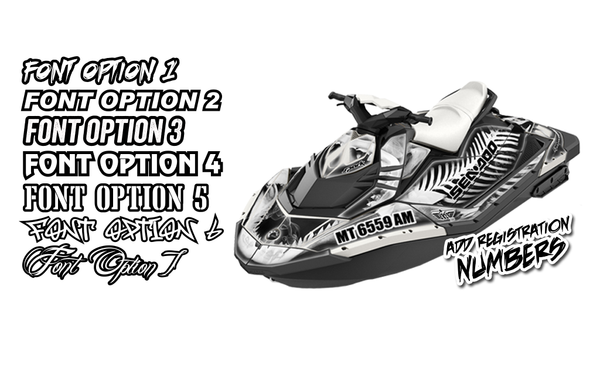 BRP Sea-Doo endorsed registration number sticker kit. Digitally printed on engineering grade high-tensile vinyl with aggressive, permanent pressure-sensitive adhesive. The special adhesive system is designed to adhere to “hard-to-stick” and low energy surfaces. Digitally printed on engineering grade high tensile vinyl with aggressive, permanent pressure sensitive adhesive. The special adhesive system is designed to adhere to hard to stick and low energy surfaces. Add your name and or registration numbers to your Boat, PWC or Personal Watercraft, UTV, SSV or anything desired. Custom number graphics are $35.00. At which point you can work directly with our designers to customize your registration numbers for perfection. Graphics measuring roughly 20 inches long by 3.5 inches tall. Minor adjustments can be made for final production. Once the order has been placed, an email proof is sent with satisfaction guaranteed.